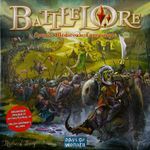 Due to the difficulties surrounding the production of the original BattleLore Core Sets (as mentioned earlier this year by CEO Christian Petersen), Fantasy Flight Games has decided to repurpose the French edition Core Sets in order to make them available for English BattleLore players! These repurposed Core Sets will include English cards and reference sheets.. The English rules, as well as any other pertinent English material, will be made available as online PDFs for download. These BattleLore Core Sets will feature a sticker that denotes them as repurposed French editions that are fully compatible for English-speaking players.